Additive manufacturing is quickly becoming a feasible option for full-scale manufacturing. The combination of modern software, new materials and printer technology is allowing additive manufacturing or AM to bring efficiency and flexibility to manufacturing operations. The parts created using these processes are often left with very rough surfaces and scale and other imperfections. 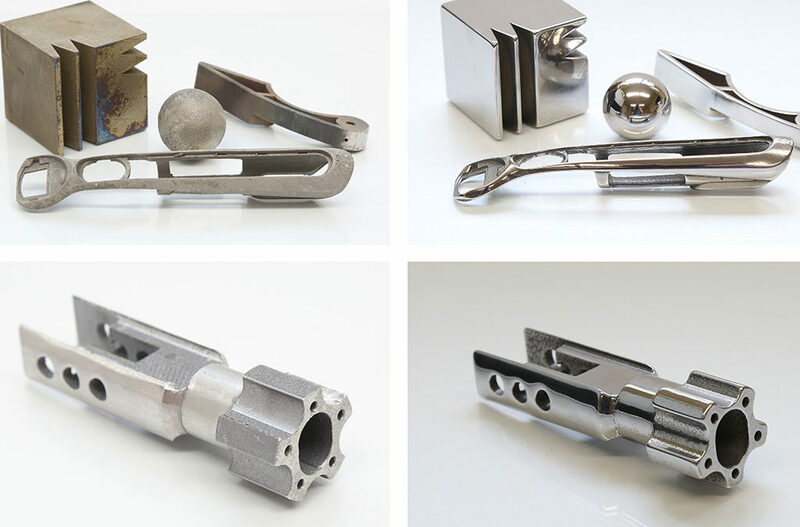 Companies using additive manufacturing need to come up with a quick solution for smoothing and polishing their parts. 3D Printing of models is often referred to as “Rapid Prototyping.” Using traditional hand polishing methods to improve the extremely rough surfaces of these parts is anything but “Rapid.” An operator can spend days to get all of the surfaces smoothed out by hand. Mass Finishing Centrifugal barrel tumblers can achieve a polish on several parts at once (Like the ones featured here) in just two hours. Achieving a polish on a 3D Printed part depends greatly on the material and the initial roughness and scale left over from the printing process. 3D printed parts that have a high production volume to justify tumbling equipment tend to be smaller in size. For this reason the HZ-40 is a popular option. It’s small footprint (roughly 3′ x 4′) makes it ideal for fitting into tight lab operations. For parts that are too large to fit in the HZ-40 barrel (longer than 10 inches and wider than 5 inches) a larger machine like the HZ-120 or HZ-160 with a bigger processing chamber is needed. If the part doesn’t require a high energy finish, a vibratory tub like our PV-Series Tubs make a nice ancillary option. They are relatively inexpensive, but will take a much longer time to perform surface finishing on parts. If you have additive parts and are looking for a high polish, you can send them to the MFI testing lab for free test processing. Do you have a small video to send my mail? any possibility to source this surface processing in INDIA ? I am very interested in HZ85 and HZ330, please contact me. I am in Taiwan.